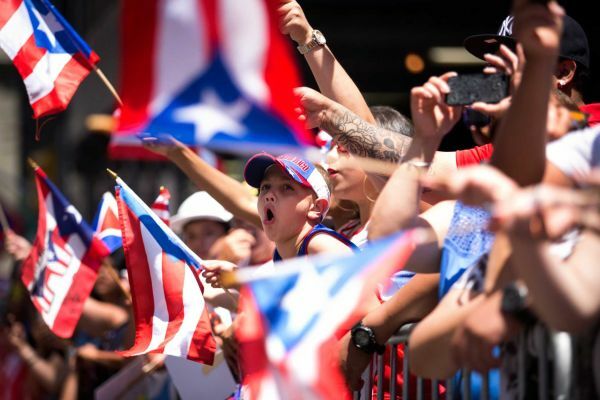 A euphoric celebration of Puerto Rican heritage along Manhattan’s Fifth Avenue Sunday reflected the island’s strong sense of pride and identity, Newsday reports. It also was a statement of Puerto Rico’s massive footprint in New York City. The National Puerto Rican Day Parade was a six-hour, 35-block party complete with dancers wearing traditional costumes with full, flowing skirts; trucks blasting salsa, reggaeton and pop music; sports cars bearing beauty queens; and elaborately decorated, brilliantly colored floats. Spectators formed a mass of fluttering blue, red and white flags, and airhorns sounded continuously. Organizers of the 58th annual march were expecting 2 million people to attend. “We love our island,” Sonia Rodriguez, 54, of Copiague, said of why such massive crowds gather each year. Her sentiment spanned three generations. Rodriguez’s daughter and granddaughter — Jennifer Lopez, 27, and Adamaris Velazquez, 8, both also of Copiague — stood alongside her, cheering.